Hi there, my name is Amy Bloxam-Prihoda, co-owner of Professional Carpet Systems of Connecticut serving Fairfield, New Haven, Hartford CT and surrounding areas. We are so glad that you have found yourself here on our site and hope that the information that you find here is valuable to you. At Professional Carpet Systems we are focused on and committed to providing our clients with exceptional client service. We realize that you may have had a bad experience in the past with another carpet cleaner, like so many people have, and we would like to show you that we’re not your average carpet cleaner. Professional Carpet Systems was founded in 1978 by Joe and John Lunsford, whose mother, Jean Beason, was an accomplished chemist. They wanted to find a way to extend the life of carpet when the carpet was still in good condition, but the appearance was unacceptable due to loss of coloring or the color of the carpet was no longer what the consumer wanted. After years of research and testing, Ms. Beason came up with a unique, on-location dyeing system and, after extensive testing, they launched Professional Carpet Systems in Atlanta, Georgia. Their system was immediately embraced in the market place, and the company was a huge success. Not wanting to keep this concept to himself but realizing that he could not expand it throughout the United States by himself, Joe turned to franchising the PCS system in 1982. 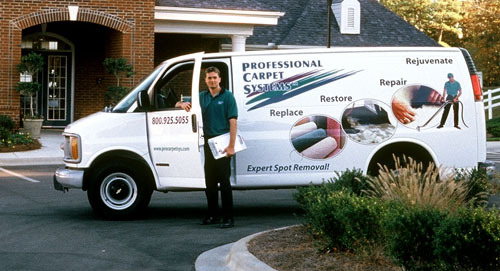 Today, PCS has expanded its services to include carpet repair, water damage restoration, and now carpet replacement. Professional Carpet Systems boasts of 75 active franchises in 32 states plus Canada and internationally in 7 foreign countries. The average franchise in the PCS system has been associated with the organization for over 9.5 years. PCS is a dynamic and growing franchise consisting of a mature core and a new direction and horizon.